Within a national park, Playa Manuel Antonio allows you to combine a bit of history with a lot of classic sun-and-sand fun. The stone turtle traps here bear witness to the area's pre-Colombian tribes, while a family-friendly vibe and plenty of sandy space invite visitors to picnic or play sports. Backed by lush vegetation, the beach remains a popular spot for swimming, surfing, and soaking up some warm Caribbean sun. The surrounding area boasts an impressive diversity of wildlife, including over 100 species of mammals and nearly 200 species of birds. 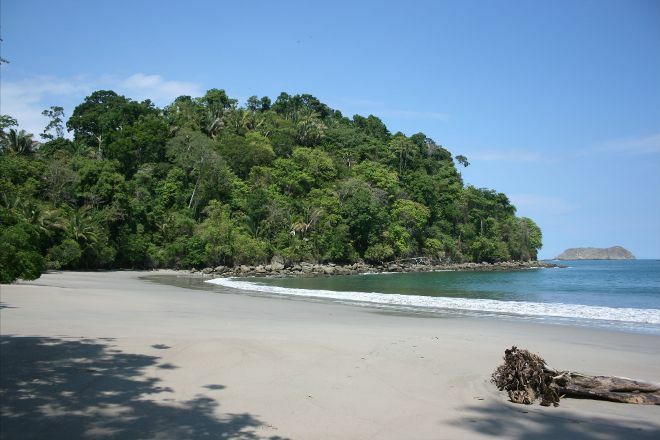 Put Playa Manuel Antonio at the forefront of your travel plans using our Manuel Antonio online tour itinerary planner . Picturesque beach after a 25-30 minute hike. There is shade along the treeline so you can have a spot to cool off. The monkeys are friendly and nice to look at in their natural habitat but please don't feed them. The monkeys will get rowdy and they will swarm your blanket area and take bags, pocketbooks, etc looking for food. $16 per person if you are not a local to enter, allowing you to see the wildlife and visit the 3-4 beaches in Manuel Antonio National Park. The park beaches are much more tranquil than the free beaches in the area because there are no vendors and much less populated due to the entrance fee. If you leave your bag unattended on the beach and have food in it, the monkeys will come out of the forest, look through it, and steal your food from you :) I don’t suggest taking the guide at $20 per person, you can see many of the animals without their help and you will stand around while having to wait for your group to look at each thing.